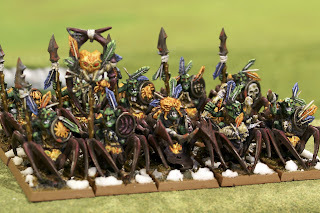 There has been some talk of the snow effects used on the Orc army and I wanted share my experiences using Woodland Scenics Snow Flakes. Mr. Justin has a great tutorial about using Snow Flakes which was my starting point. Here is the effect used with WS's Realistic Water. I don't like it, to be honest. True it makes a wet snow appearance. But it doesn't have the pop that I was looking for. It was very realistic, but did catch my eye. You can also see that Realistic Water is somewhat expensive, and this technique uses a fair amount of the water (and less of the cheaper snow flakes). Here is the effect with PVA glue which I liked much more. First off, it gives a much sharper contrast against the dark colors on the orcs. 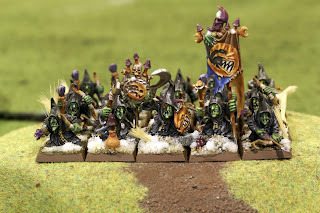 True it does look like 'fresh' snow and I used it on models that I thought would be 'out front' more in this army. It also was placed on models where I thought snow would collect. Its also much cheaper. I currently buy my PVA glue by the gallon. Its cheaper than RW (by far!) and has far more uses. Face it, at this stage of the hobby you should by buying your PVA glue by the gallon!